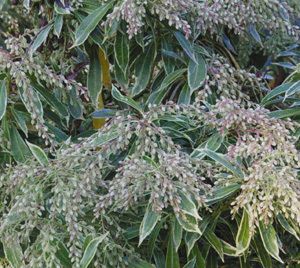 Joy Creek Photo Archive (c) all rights reserved The evergreen foliage of Pieris japonica 'Variegata' is larger than that of Pieris 'Little Heath' with a varying cream colored edge around the glossy thick narrow leaves. The winter buds are less pink than 'Heather Bun' as well. After 6 years our specimen is 3 feet by 3 feet. A Great Plant Picks selection. Early spring. 5 ft. x 5 ft.